Greetings! I’m Jerry born in Ireland in 2006 and I came to England as a youngster to run in races here. My competition name is Farren Jer. I ran 18 times and won 3. I had to take early retirement due to a sports injury to my wrist. At the time it was a blow as I used to love to run with the others. Little did I know what a great future I had in front of me. The humans I raced for took me to my Butler and gave me to him… he says, “one of the nicest things anyone has ever done for him.” It certainly is the best thing that has ever happened to me! He knows just what I want and when. When I first arrived in Sarratt I must say getting onto the bed was tricky with my long legs so he just sawed off a couple of inches of wood and hey presto I could just get on as easily as anything!! So kind. I absolutely love going out in the cars… in fact the mere whisper of the magic word C A R and I just start to bounce and bark, I don’t know what comes over me but I get soooo excited. Most days we take the everyday car for trips to Chipperfield but the best fun is when we take out my 1933 Austin 7. 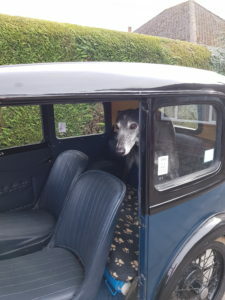 My butler drives and we go out in the Austin 7 on ‘ High Days and Holidays.’ I fit very well on the back seat. I like to stretch my legs 4 times a day. First thing we pop over to the KGV playing fields and later on we go to the Village green, most days we pop into the car (bounce bounce) and take a stroll around the Apostles pond. Back in the day we used to meet up with the Greyhound club and stroll with 50 other long leggeds. 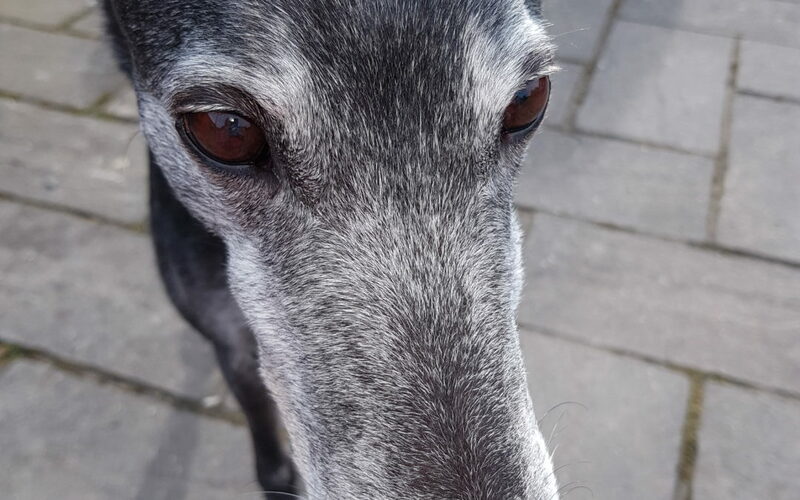 I’ve even been in the Abbotts Langley Carnival with my Greyhound gang. I am very punctual and if a certain person does nod off I give him a quick prod with my long nose and a sharp bark to wake him up. The thing I love most about living here in Sarratt is all my friends I see each day when I am out and about with my Butler. P.S. Don’t forget the Dog show on the 10th of June on Sarratt Village Day!